Paradise Valley is a lovely smallish town in Maricopa County. Beautifully situated at Mummy Mountain and boasting eight resorts it is easy to see why it is a destination popular with visitors and tourists. Paradise Valley residents claim :there is a reason with call this ‘paradise’, however despite its upscale living and great scenery, in many aspects it is a community just like any other. People go to work, open and run businesses, and have to pay taxes. If you want to ensure that your business dealings and personal taxes are on the up and up, you should work with an experienced Paradise Valley tax lawyer to prevent negative repercussions with local or federal tax authorities. Fingers crossed that you will never be involved in a tax dispute with a federal or local tax authority, but if the worst should come to pass, you can be certain to get the best legal tax representation with the experienced tax lawyers at Silver Law. All of our lawyers have an intimate knowledge of tax law and proceedings as they are former employees of the IRS. This in-depth knowledge qualifies them to expertly represent you in civil or even criminal tax litigation proceedings. Our Paradise Valley Tax Litigation Attorneys possess years of experience in and out of the courtroom, having represented clients in Arizona’s state and federal courts – even the U.S. Supreme Court. With over 80 years of combined tax law and litigation experience, you know you get the tax litigation representation you need to get the best possible outcome for your case. Because most tax disputes are already settled at the audit or appeal level, our Paradise Valley tax lawyers have extensive tax appeal experience as well. We understand how to increase your chances of an early and satisfactory settlement, but also prepare for possible litigation. If you are involved in a dispute with a tax authority, we can help you to determine the best course of action. No matter if this includes submitting and informal or formal request, filing a lawsuit or appealing IRS collection. However, a tax appeal is really designed to settle a disagreement with the tax authority without having to go to court. Here at Silver Law we have your best interest in mind and strive to find a solution for your particular situation. You can trust our lawyers with your tax appeal proceedings. We can appeal tax issues relating to a variety of different situations. 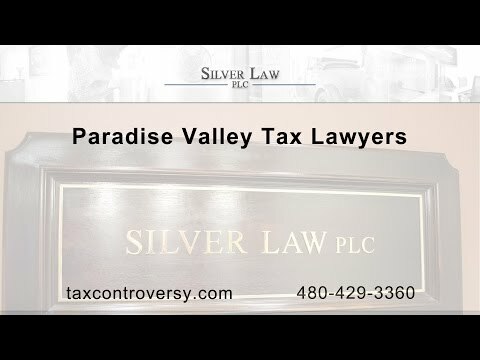 Silver Law’s experienced tax lawyers are able to represent Paradise Valley individuals and businesses alike. Regardless of your personal tax return is being audited or if there are issues involving your business taxes, we can help you resolve the tax controversy fast and efficiently. We understand that taxes can be intimidating and confusing and we work tirelessly to help you and your business. No matter if you need tax audit representation, are looking to file a tax appeal or are even facing tax litigation, our tax attorneys will provide the proper legal representation for your individual situation. Facing tax claims or criminal charges can be scary. Silver Law’s extensive tax litigation experience in both civil and criminal cases will benefit you in receiving the best tax litigation representation in Paradise Valley. We can negotiate Offer in Compromise, Installment Agreements, Tax Levies and Liens, Employment Taxes, and Trust Fund Recovery Penalties on your behalf. Should you receive an audit notice or find yourself in quality representation in legal tax matters contact Sliver Law today. Our office hours are 9 am to 5 pm. Evening or weekend appointments are available by appointment. You can reach us at 480-429-3360. When is a Penalty Really a Penalty?